Your website is an interface for buyers and providers of a specialist service. The service may be ordered via a computer, smartphone, tablet or any other mobile device. 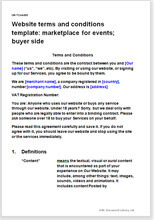 This website terms and conditions template sets out the relationship between your business and those who buy through your website. The service bought and sold could be anything. You might specialise in one product, or you could sell a wide range of products. You do not need to have more than one provider client but we assume that you will. Most of your providers probably use your services because they do not have an internet facility for taking money or because your marketing service is better than they could achieve. You are simply marketing and collecting money. Providers upload necessary information to your site or complete your pre-set data entry boxes. Any other arrangement could be accommodated provided it is via Internet or other electronic medium. We have provided for basic contract procedures, but information on how the service is provided must come from the providers as it will differ in every case. You should therefore pair this document with the most suitable provider side marketplace T&C document we offer. See below. It is possible that some of the providers who use your market place service also have their own contract with each client you introduce. You may need to provide for that in your website structure. We cannot help you because we do not know what terms a provider might need. It is important not to confuse the service you provide through your market place website, on the one hand, and the service you sell through your website on behalf of others, which is no part of your business. has either regular sellers who operate their business from your site continuously, or allows one-off sales. protect your business from complaints about content that your buyers posted - particularly important if buyers can post product information or interact with buyers without you actively monitoring every post or message. This document provides only the terms between you and your buyers. You will need a matching document that regulates the relationship with providers. Provisions you will need for buyers vary more than those for providers. So while this document covers many types of service, we offer several “buyer side” versions. The most appropriate “twins” for this document are Website terms and conditions template: marketplace for services; buyer subscribes for access or Website terms and conditions template: marketplace for services; seller side. This document serves two purposes. First it protects you in law from a huge array of potential problems arising from disputes between your provider and his client, and secondly, it enables you to set out how your website works to benefit the buyer. It is assumed that both providers and their customers will have access to your website for one or more reasons. Examples reasons are: to upload their own marketing text and images; to place adverts; to contribute to forums; to communicate with each other; to resolve disputes; to give testimonials; to communicate with you. We have therefore provided very wide ranging protection. This will be more than you need, but can be edited easily by deletion, as can any text in a Net Lawman document. Extensive options as to what a provider may or may not do on your website. Over 3,000 words of drafting notes to help you.